Since 1970 Command Service has provided dependable service and quality products to our customers. Command Service meets the highest performance standards in the business from employee training to customer care. We have highly skilled technicians and a knowledgeable office staff to meet your comfort needs. Command Service is also highly trained in the field of appliance repair. We have met the highest standards to be certified as a Trane Comfort Specialist™ Dealer. All Trane dealers are not created equal. This is why you must be thorough when selecting one. But, here’s something that will make your search a little easier. Just look for the Trane Comfort Specialist badge. It will indicate a Trane dealer of the highest standing – a dealer that is committed to excellence in every aspect of his business, from installation and service, to customer care and employee training. The Trane Comfort Specialist™ designation is not easy to come by. Dealers qualify for this honor on a yearly basis by meeting the Trane Company’s stringent standards for professionalism and technological expertise. When it’s time to purchase a heating and air conditioning system, put your comfort in the hands of a Trane Comfort Specialist™ dealer. Put your comfort in the hands of Command Service! Steve was born and raised in Glenview, Illinois. 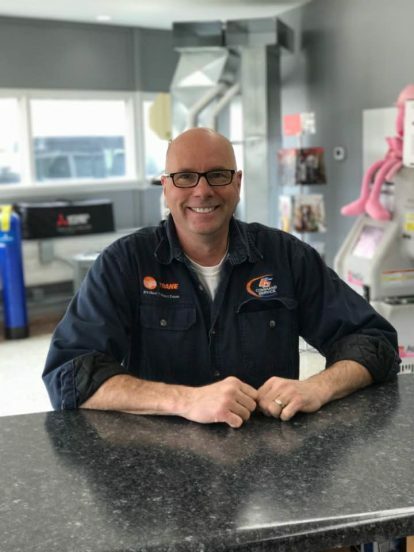 His father, Robert Milliken, did heating and A/C repair for North Shore Refrigeration, and as far back as Steve can remember, he was always very involved in his dad’s work. His dad would take him to work and Steve loved to run and get parts from the warehouse for the service guys. In 1970, his Dad opened his own company, and up until high school, Steve worked summers for him as a laborer. Steve was not planning on following in his dad’s footsteps, and while attending Maine North High School, he received a football Scholarship to Northeastern. Unfortunately, he blew his knee out , and ended up agreeing to work for his dad for $50 a week in order to learn the business. After 35 years, he is still passionate about what he does! Steve’s parents started Command Service with one customer, and built their business by referrals. Integrity was everything and his Dad taught him that your word means everything. That’s how he ran the company for over 35 years, and Steve continues to run it with that as his foundation. Now in its 47th year of business, some customers are 3rd generation, which he takes great pride in. Steve has been married to his sweetheart and partner Mary for nearly 20 years, and is the proud parent of 5 children and 2 grandchildren. They have worked together and taken the business to the next level. They recently opened the newest location for their business in the heart of downtown Antioch. They are active members of the community and are excited with what the future holds.